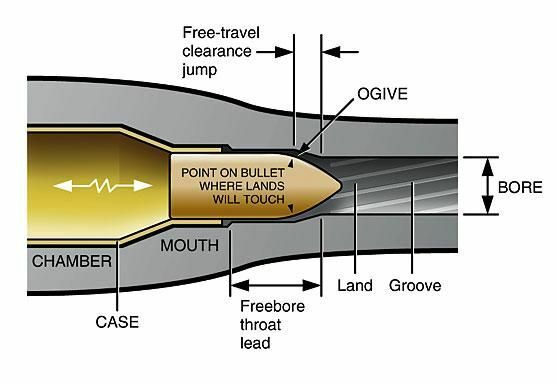 The OA length you are measuring is from the head of the case to the tip of the bullet. The distance to the rifling of your barrel is not really related to that distance at all. Bullets profiles can be short and fat or long and pointy. Moving back from the tip which something less than .308", the part of your bullet that is first .308" is known as the ogive. The jump that matters in barrel harmonics and accuracy tuning is measured from the ogive to the rifling. The distance from the ogive to the tip will vary from bullet to bullet even in the same lot of match bullets (up to .012"!) but the distance from the base of the bullet to the ogive is very consistent on quality bullets (.002" max usually). To control this distance you really need to use a quality seating die and a comparator tool. ( Hornady makes one) The seating dies do not seat from the tip but rather some point on the profile between the tip and the ogive. Your rifles magazine will determine how far you can seat a bullet and still run it through the bolt in rapid fire. But if you single loaded you could load a longer bullet - up to the point where the ogive is jammed into the rifling and the bolt wont close. You have determined a sweet spot that gives you MOA results at 200 yards - that is great! To make a guestimate of your bullet jump without a comparator you can loosely seat a bullet way too long and put it in the chamber and let the bullet be seated by the rifling. You will want a cleaning rod around as you will stick a couple of them in the rifling until you get it close. When you seat a bullet tha just gets some marks on the ogive measure that oal. Then seat the bullet in your seater die that you have set up from your 3.367" dummy. The difference in the se lenghts using the same bullet will be close tou your jump distance. Hey DawgDad that was the very best explanation I've heard!!!! Thanks - its even better with pictures! I know one match shooter out here that seats his boolits closest to the rifling as he can to eliminate any chance of wobble or whatever. Sure his is a custom gun, rifling and all that and it works for him. But on my M700 /06, if I seat the bullet closest to the lands, accuracy suffers. Every gun is an individual, and if you roll your own, you can find the sweet spot. My match load likes a jump of .015-.010" - No more, no less. Outdside of that range, the groups grow. why is it called a jump? is it because of a lack of a better term? since the bullet contacts the lands before it leaves the case. because it's unguided. It can go up or down, left or right and not entering the barrel straight in the middle. And you cannot predict how he's going to jump next time because so many things influence its flight. So it might touch the lands before leaving the case, but you cannot predict what part of the bullet will hit them first. When I load 210 gr Berger VLDs in my 300 Ultra for targets I actually cannot put them in the floor plate of my Mod 700 LSS as they are too long, yet they do not touch the lands. For hunting loads there is no worry of getting them to touch on that firearm. Really depends on the gun and the bullets you use. Yet I had the same problem with Federal ammo with Sierra bullets. Tracked many-a-deer before I got wise to that little problem. In my most humble opinion (noticed how I spelled that out rather than abbreviated...rebel) Sierra's jacket is too thick. Although, as you all know, I like a bullet that explodes like a grenade. I understand what you are saying and will work on that and post again when I have a ogive number and the number of the jump I am now using.